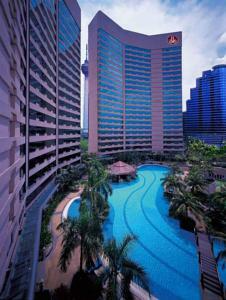 Housed in 2 modern wings, the luxurious Renaissance Kuala Lumpur Hotel is located 550 yards from Petronas Twin Towers. Overlooking the city, it has an outdoor pool and 5 restaurants. Stylish and elegant, rooms at Renaissance Kuala Lumpur feature floor-to-ceiling windows and a cable TV. Private marble bathrooms come with both bathtub and shower facilities. At Mandara Spa, guests can enjoy a massage or relax in the sauna. Other recreation facilities include a fitness center and tennis courts. Laundry and dry cleaning services are available upon request. Dynasty Restaurant serves a selection of Cantonese dishes, while the award-winning Sagano Restaurant offers a delicious Japanese menu. Drinks and light snacks can be enjoyed by the pool at the Health Bar. Many shopping complexes are found within one mile of Renaissance Hotel, including the Pavilion Kuala Lumpur and Sungei Wang. Kuala Lumpur International Airport is 30 miles from the hotel. Rooms: Hotel Rooms: 921, Hotel Chain: Marriott Hotels & Resorts, Renaissance Hotels & Resorts. Wired internet is available in all areas and costs MYR 25 per hour. Free! One child under 12 years stays free of charge when using existing beds. Free! One child under 3 years stays free of charge in a baby beds. One older child or adult is charged MYR 100 per person per night in an extra bed. The maximum number of extra beds/baby beds in a room is 1. Any type of extra bed or crib is upon request and needs to be confirmed by management. Supplements are not calculated automatically in the total costs and will have to be paid for separately when checking out. American Express, Visa, Euro/Mastercard, Diners Club, JCB, Maestro The hotel reserves the right to pre-authorize credit cards prior to arrival.